Sumona Couture launched her Bridal Pop- up at an evening high tea soiree with Bollywood actress Pooja Chopra at Hue, Hughes Road. 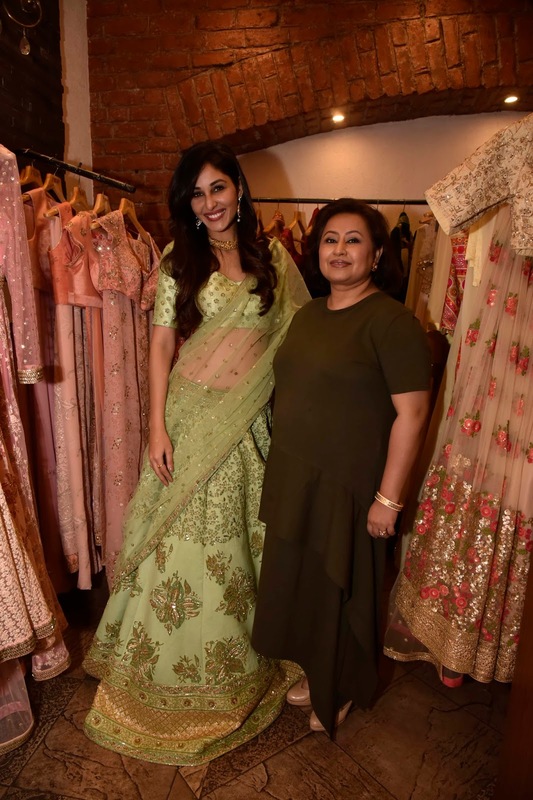 On the occasion, the designer Sumona Parekh, who is the brainchild behind the brand, unveiled their Spring / Summer Bridal Collection 2018. The Spring / Summer Bridal 2018 Collection from Sumona Couture is all about soft pinks, peaches and green. There are the customary gold and red but summer colours are predominant in this collection. They have developed and showcased their own block print of the forget-me-not flower in both khadi cotton and georgette. The USP of the collection is that everything is under one lakh rupees, making this affordable whilst ensuring that every bride feels like the princess she is on her special day. The feeling of spring flowing into summer can be clearly seen with the feel of the block printed flower as well as the repetition of the 5-petal flower repeated in aari and zardozi work hand-embroidery. This theme dovetails neatly with Sumona Silver where that same 5-petal flower has been used in hand-crafting and ornamentation. Sumona designs both bridal couture and silver jewellery. The silver jewellery is as lightly crafted as her clothes. According to Sumona Parekh, “We wanted to make clothes that let women be comfortable and really have fun while still being as glamorous and special as they felt inside. The clothes, including the lehengas, are extremely light and are priced extremely reasonably. It's every bride's dream come true to possess such beautiful outfits."